I was recently given the opportunity to be curator for the Nottingham Geekup community. As a regular attendee for several years and previous speaker, I thought this was a great opportunity to give something back. As curator, it was my task to find the speakers for the night and arrange the format. That didn’t sound too hard and certainly not as nerve wracking as actually giving a talk myself. However, once I’d volunteered I quickly realized that my pool of potential speakers was quite small. Never mind, I only really needed to find 2 or 3 speakers so it shouldn’t be that hard. Encouragingly, as I mentioned this need for speakers I quickly had 2 or 3 volunteer, but their talks didn’t fit into any kind of theme. I was also determined to try and make the night a little different to previous events. One item that had concerned me over previous months was just how forced the coding exercises had been. I was pretty sure I didn’t want to involve any coding this time. As time passed, I got more focused on finding a suitable format for the night and would need to let people know I needed them for a talk pretty quickly. I also thought it would be a good idea to press home the benefits of attending geekup to my work colleagues. I collected a number of talk ideas and asked my team to vote on the best ideas with the premise that if you voted for a topic you were also committing to attend. A last minute suggestion of a “programming war” was voted the most popular, although a few people expressed concern around the adversarial language of such an event. This changed the nature of the event completely. Now it really only made sense that I ran the night completely and that it would be completely code focused! In order to address some of the competitive nature of the event I rephrased it as a “language showcase” and focused more on learning than competition. I also felt it important to try and do the coding a little differently than before. Whilst we have done many coding exercises at geekup in the past, we hadn’t spent much time trying to analyze or compare results. This became the focus for the night and also helped enforce the showcase part of the title. Overall, I was pleased with the way the night went. I really enjoyed hosting the night and seeing so many people engage with the problems and share their results afterwards. I’ve talked a lot about recruitment and hiring people in the first place, but what about when people leave? How you deal with people when they leave, and in particular during their notice period, can have a big impact on how they remember you and your company. Firstly, lets acknowledge that when someone tells you they want to leave it hurts. You may have known them a long time, considered them friends and offered them the job in the first place. It feels like a huge rejection and you can feel foolish as if none of those previous experiences mattered. This is a natural reaction, but don’t let it shape your actions. Take a deep breath, bite your tongue and calm down. It was probably a difficult decision on their part and they will appreciate a professional response. This is a stressful time, so taking any emotion away can be a big help. Secondly, once the dust has settled, make sure you use the time that person has left with you wisely. You need to make sure all the knowledge they have is not lost when they leave. You should also try and learn the reasons for them leaving. Whilst everyone is different, if there is something you can discover, improve and prevent others leaving then it is worth listening. Again, take the emotion out of the situation, encourage an open discussion and don’t argue. You may hear a number of criticisms of yourself, your colleagues and your company; this can hurt, but don’t react emotionally. A bad reaction can simply end the conversation and prevent you learning any more valuable information. Instead, you need to listen, take note and thank the other person for their honesty. You don’t have to agree with the criticism, but you shouldn’t just dismiss it. Whilst it always has an impact when someone leaves, by reacting in the right way you can at least try and get something positive from the situation. Ex-employees can still be friends and may want to work with you again in the future if you handle this situation well. We are often told when managing software projects that things should be more predictable, more repeatable and that our projects are less in control than others. As we saw previously, I’m not convinced. I’ve been watching with interest over the past few years as a major road upgrade has taken place near my home. This was a 3 year project to convert a single carriageway into a dual carriageway and involved rerouting the road, creating some new roundabouts and bridges – including one that carries a railway line. Overall, I’d say I’ve been reasonably impressed with the way this project unfolded. It started on time, appeared to progress on schedule and was officially opened on time. 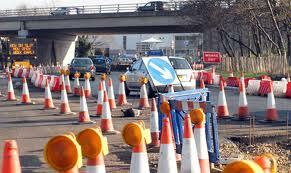 However, whilst the signs along the road side state that there would be disruption until Summer 2012, we still have cones along the roadside and overnight closures of certain sections. I’d say that this project is definitely not complete! So what happened? And what can we learn about our own projects here? Firstly, predicting timescales on any large project is hard. The combined uncertainty of so many tasks can add up to make predicting an end date more of a guess than a science. It was interesting to see that the end date they used on the road signs was Summer 2012, not 5pm on 1st June 2012. Communication of end dates can be a useful way of inferring confidence, stating Summer 2012 shows the wide range of possible end dates that might be acceptable and shows the uncertainty with a lack of precision. I have no doubt that a project manager somewhere will have sat down with a tool such as MS Project and will have added all the road building tasks onto the plan. Fortunately they avoided the trap of using the dates in that tool as the dates they communicated. I also noted that at certain times of the project, they could predict with great certainty when parts of the road would be closed. Signs would appear warning of closures for the following week. Again, underlining the ability to predict with some certainty events that are close by (although even then sometimes the roads didn’t close when the signs said they would and the next day the sign would be updated with a different closure date). This ability to predict close events with some degree of accuracy and further events with less is described as the Cone of Uncertainty. Secondly, defining when a project is done is critical. When upgrading the road, the definition of done seems some way off my own definition of done. They officially opened the road on time, so perhaps they were happy with their definition of done, but as someone who drives on that road, I am not. I have no idea why work is still being done on the road. The road is functional, it has lines painted and lights on the side, so you could argue as version one it meets the Minimum Viable Product we might release as a software team. A lot of traffic is using the road, so they are clearly providing value by “releasing early”. Perhaps they have simply entered a maintenance phase, maybe they are taking the opportunity to reduce their technical debt. Whatever it is, I just wish they’d hurry up about it! I’ve written a few times about recruitment. In particular you can read what I had to say on Job Applications and Interviews. There are even some amusing stories from my Interviews. This time I’d like to share a talk I did for GeekUp Nottingham (@geekupnotts) which was all about hiring and getting hired. You can watch the video below or view my slides here. You probably want to skip the first 18 minutes of the video (it was being streamed live, but we had a few technical issues getting started). The excellent @samwessel is the first speaker, well worth a watch. My talk doesn’t start until about 52 minutes in. In the previous parts, we looked at how things used to be in the development team, and then looked at how things are now. This time, lets look at the areas that still need improving. As a small company trying to get started, it was important that we used our ability to react quickly as one of our strengths. Speed was very important in the development team, but one of the ways we achieved that speed was by taking on technical debt. Now that we are larger, speed is less important and quality and predictability are the main requirements. Our software code base is larger and areas of inflexible design have surfaced. We need to re-factor into smaller replaceable components so we can keep the product fresh and modern. We can count this as another of our areas of technical debt that we need to reduce. We need to find ways of reducing our debt whilst maintaining our ability to ship real benefits to customers. One of the main techniques we plan to use to improve our quality and reduce technical debt is Test Driven Development. We’ve been keenly watching the Uncle Bob – Clean Coders videos as his use of TDD has been a revelation. As a test team we haven’t made as many changes as we could. We have started the process of automating our testing, but too much is still manual. We spend a long time with our regression tests; often not finding any bugs, but using as much as 2 weeks of our time. When we’re aiming for a monthly release cycle (or shorter) this is more than we can afford. It was noted from hearing Uncle Bob talk about his work on FitNesse, “if the tests pass, we ship”. That has to be our goal as a development and testing team; having such a comprehensive set of automated tests, that if they pass, we ship. A constant battle in project management, between stakeholders and the project team is in understanding when a project will be complete. Agile methodologies attempt to address that issue, by offering a new version regularly and letting the product owner decide when a version is complete enough to ship. However, unless the whole business is truly agile, then this doesn’t really work; marketing want to announce what’s coming for the next year, and expectations are set with customers. No-one wants an estimate or to be told to wait 2 weeks at a time to see if the system is what they want. What they really want is a commitment! So whilst we can work in 2 weekly sprints, and can release software to our customers monthly, we need to plan for something like quarterly commitments. To have any chance of keeping these commitments, we need to use some of the more traditional project management tools to manage change (and restrict it). We need to remove risk, and we need to estimate the size of tasks more accurately. Whilst our stated aim has been for a monthly release, these have been stretching out to nearer 3 months and that starts increasing the pressure to delay the next release. No-one wants to take the risk that if their sponsored feature misses the current release that it will then be a further 3 months before it can be released. One of the tools that we can use to change this is to make our behaviour visible. We have started to track our key metrics, what date are we aiming to have developed all our new code for? How many features and fixes are still in development? How much have we already passed to the test team? Once we have this information, we can measure our progress, track our confidence for making the release and then adjust our plans accordingly. By using a daily stand-up with the key members of the team, we keep visibility and remind everyone of our targets. We can also display these metrics in a public place so that everyone is aware of them. One of the thought experiments we can run is to find out which parts of our process would stop us releasing software on a weekly basis. At the moment that is our manual testing, but as we automate more of that we should keep our eyes on what else might be slowing us down. If we get to a point where we could release weekly, then the next step is to look at what would prevent us releasing daily. One of the big benefits of a daily, automatically built, tested and ready for release version of our software would be within our support team. Our support developers still spend a lot of their time producing hot fixes and sending them to customers. These are manually built, put together and tested by the developer who made the code change. Automating this process would free up more time to help other customers and reduce the occasional mistakes we make following this manual process. If you’ve followed all 3 of these posts on progress then hopefully you’ll have seen how far we have come as a team; from sound principles, but poor practice, to a more modern approach with a vision of where we still need to improve. It really is a credit to the team members, both past and present that have helped drive the change whilst maintaining a high quality product for our customers to use and our business to sell.